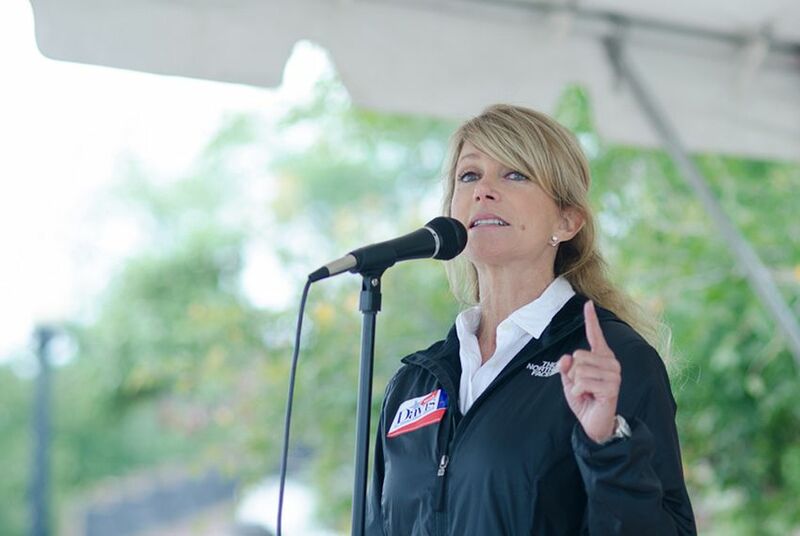 Wendy Davis came off the Senate floor early Wednesday as the national Democratic Party's newest star. But what effect her 11-hour filibuster to stop abortion legislation will have on her political prospects in Texas is an open question. Wendy Davis strode onto the floor of the Texas Senate chamber on Tuesday in rouge-red running shoes, and came off it early Wednesday morning as the Democratic Party's newest star. During 13 hours in between, the legislator from Fort Worth delivered a filibuster that electrified social media and stopped passage of one of the nation's toughest set of abortion restrictions in the waning hours of a special session. As word spread, supporters thronged the Capitol's entrances, lined the walkways encircling the rotunda and turned the Senate chamber's gallery into a cheering section. What made the scene so riveting was the woman who was required by the rules to speak without a break, without straying from the topic and without even leaning on her antique walnut desk. As time ran out, Republicans deemed her to have violated those rules — including once for being helped with a back brace — and made her give up the floor. Such was the bedlam, however, that when the 19-10 vote finally happened, it came several minutes too late for a midnight deadline. a time in a trailer park and graduated with honors from Harvard Law School. As she spoke, Twitter registered 400,000 tweets with the hashtag #standwithwendy. One of them came from the official account of President Obama, and said: "Something special is happening in Austin tonight." But it was a rare — and likely temporary — victory for abortion rights advocates. Davis succeeded in running out the clock on the session. So late Wednesday afternoon, Gov. Rick Perry announced that he would call the Legislature back for another special session, to begin July 1. The abortion bill appears certain to be considered again, and if Republican leadership moves quickly, it will not be subject to a filibuster. "Obviously, if he brings that back again and the management in the Capitol on both sides manages time better than they did when we started this past special session, that bill will pass," Davis conceded in an interview. The legislation would ban abortions after 20 weeks of pregnancy, which is about four weeks before a fetus is viable; mandate abortion clinics to meet the same standards as hospital-style surgical centers and require doctors who perform the procedure to have admitting privileges at nearby hospitals. Advocates of the legislation say it is a means of assuring abortion is safe; opponents say it would force nearly every abortion clinic in the state to close. In the 2012 presidential and U.S. Senate elections, Republicans felt a backlash for waging what Democrats branded a "war on women," particularly on questions involving contraception and abortion. But there is a political tide pulling the other direction. During the more than two years since the 2010 elections strengthened Republican power in state capitals across the country, many have moved to put new limitations on abortion. Last year alone saw 19 states enact 43 new provisions aimed at restricting abortion, according to the Guttmacher Institute, an advocacy and research organization that promotes abortion rights, but produces data that is often cited by advocates on both sides of the issue. Kathy Hawken, a Republican state legislator who had been among the leaders of the unsuccessful fight against North Dakota's restrictive new abortion law, was on a vacation getaway with girlfriends when news of Davis' filibuster came across her Facebook feed. "I was impressed, particularly in Texas," she said. "I'm hopeful that this is the start of something bigger." The abortion debate has revived in Washington, D.C., as well, following the conviction last month of Philadelphia abortion doctor Kermit Gosnell, who was found guilty of three acts of first-degree murder in the deaths of infants born alive while he was performing late-term abortions. Last week, the Republican-led U.S. House passed a bill that would ban almost all abortions after 20 weeks gestation. While the bill stands no chance in the Senate, and is constitutionally questionable, its supporters say it will be an issue that energizes conservative voters in the 2014 elections. "Just talking about the economy all the time, jobs and the economy, doesn't motivate people to get out and vote," said Marilyn Musgrave, a former Republican congresswoman from Colorado who now serves as a vice president of the Susan B. Anthony List, an organization that recruits anti-abortion women candidates to run for office. Davis' own political future has also become a hot topic. As a newcomer to a Legislature that meets in regular session for only 140 days every other year, the former city councilwoman was named "rookie of the year" by Texas Monthly in 2009, and made the magazine's list of 10 best lawmakers this year. a budget bill that included education cuts. Perry was forced to call a special session to get them through. district where she has eked out two narrow wins. The question now is whether she takes advantage of her newfound stardom to make a bid for statewide office — something that no Democrat now holds. people," University of Texas political scientist and pollster James Henson said Wednesday. "In the long to medium run, another reality will set in — this is still a very Republican state." Washington Post staff writers Juliet Eilperin and Peter Wallsten contributed to this report.